How WordPress is the most popular CMS I can't figure. Have you ever seen digital rage? Hacked sites induce that. It's why I love Squarespace. Squarespace isn't anywhere on that list because it's designed completely differently than all those other platforms. 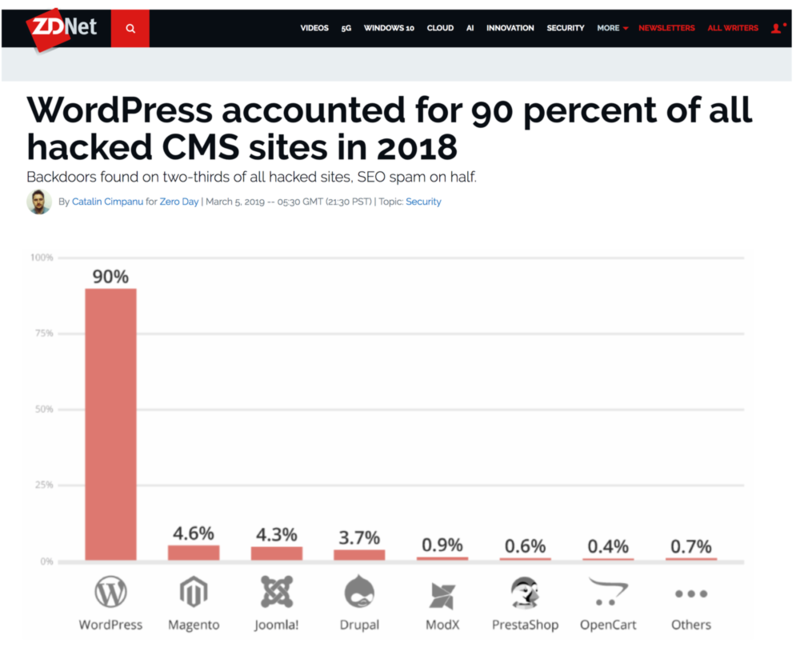 It’s a great run down on the different ways sites get hacked and is typical of most CMS systems. The rest of this article explains how we sidestep all that hacking nonsense and spend more on the content and less on the platform. You can’t move your hosting when your website is on Squarespace and that has been a game changer with some projects but that’s not necessarily a bad thing. The difference in security and hacking that’s non-existent with Squarespace offers peace-of-mind you can’t imagine until you’ve been hacked. Squarespace is different specifically because you can’t stick it on the cheapest hosting and neglect the living code base that is the heart of all content management systems. It has to be living and changing with on ongoing patching of holes that unscrupulous invaders are working to exploit ever second of every day from every point on the globe. The web’s ubiquity is also it’s vulnerability and Squarespace locks up hosting for that very reason. They make sure it’s constantly up-to-date and protected. And then there’s the tens of thousands of apps you cannot purchase or install into your Squarespace content management system. Everything you get – from design, images & video to commerce and SEO – everything is within the Squarespace walled garden. I stand corrected with that global statement in that you can use their developer platform which is insanely powerful but does lock you out of ongoing improvements Squarespace adds on a weekly basis (see example: Building the Squarespace Image Filters). This last point bears mentioning again. Not only does Squarespace keep things secure but they constantly and automatically add new shinny tools regularly. You don’t have to install anything. New things just show up. That’s actually quite amazing because they do that while still keeping the admin interface easy and intuitive. Because you can’t keep adding any new apps whenever you want, your site doesn’t degrade and slowdown – like our phones – uuuugggg! We work with the industrial strength CMS Drupal and love it’s tremendous power but systems like Drupal degrade as we add and change them. With a sea of just about any application add-on you can think of, it’s natural to use that option. But that’s where the tools become more complex, more vulnerable over time and expensive to maintain or dangerous when you do not. A completely closed but balanced architecture offers a tremendous level of longevity compared to the wide open systems. *We rank Shopify as a similar stellar product for e-commerce in the way that Squarespace is to Content Marketing because they follow this closed but extensible architecture. Visit Squarespace.com and set up a site in seconds without any cost. You can run a trial period to play and even extend that trial indefinitely until your ready to throw a credit card down to make it live. It’s the easiest no cost way to evaluate one of the many options in building out your digital marketing platform. Contact us (or click that chat button, bottom right) if you want to fast-track a build out of your content marketing and audience growing efforts with a platform that won’t be a statistic in misery.